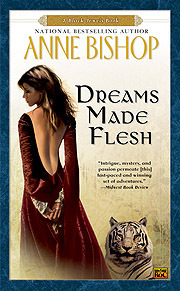 Return to the realm of the Blood in Dreams Made Flesh—featuring four revelatory all-new adventures of Jaenelle and her kindred…. Jaenelle is the most powerful Witch ever known, centuries of hopes and dreams made flesh at last. She has forged ties with three of the realm’s mightiest Blood warriors: Saetan, the High Lord of Hell, who trains Jaenelle in magic and adopts her as his daughter; Lucivar, the winged Eyrien warlord who becomes her protector; and the near-immortal Daemon born to be Witch’s lover. Jaenelle has assumed her rightful place as Queen of the Darkness and restored order and peace to the realms…but at a terrible cost. In Dreams Made Flesh, discover the origin of the mystical Jewels, and experience the forbidden passion between Lucivar and a simple hearth witch. Witness the clash between Saetan and a Priestess that may forever change reality. And learn whether the sacrifice of Jaenelle’s magic has destroyed any hope of happiness between her and Daemon.